In fall, layering clothing is vital here in Chicago when the weather can change from crisp and sunny to blustery and rainy almost immediately. 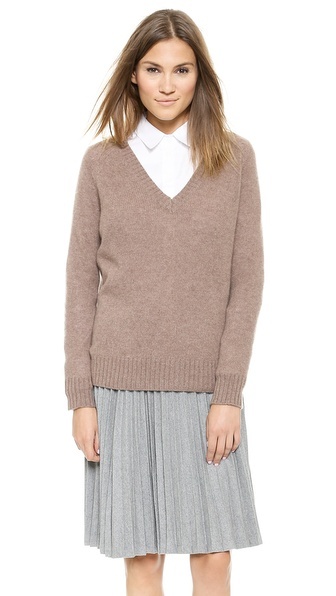 And nothing says fall more than a cozy, neutral sweater to pair with everything. Fishermen’s sweaters, cable knits, heathered fabrics, and flecked textures in neutral colors can carry your autumn wardrobe stylishly through any autumn elements. A high-quality sweater, such as one made in cashmere, can last years when cared for properly and matches everything from jeans to skirts and even dresses. Stylistically, neutral sweaters pair beautifully with both traditional fall palettes (think reds, oranges, golds, and browns) and trendier ones (pastel pink is EVERYWHERE this season). 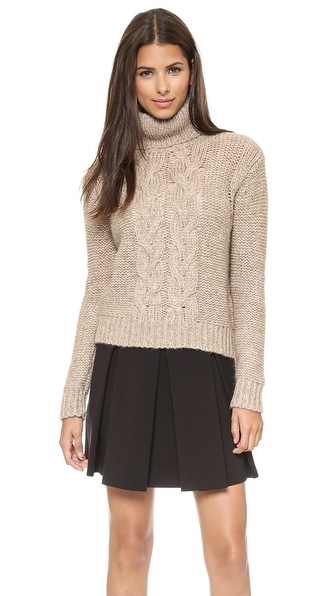 A simple knit also provides a cozy yet chic balance to fall’s rich, heavy textures like brocade. If in a lighter neutral color, a good fall sweater will also lighten a dark cold-month closet too (after all, Anna Wintour wouldn’t be caught dead in head-to-toe black). Neckline – V-necks are slimming and are more flattering on large busts while crew necks are great layering pieces but can be boxy (like this 525 america V-neck Side Slit and 525 america S/S Hi Rib Mock). Always try on a sweater before you buy it to make sure it is flattering to your natural shape. Sleeve Length – Sleeveless and short-sleeve sweaters are great layering pieces for early autumn while long-sleeve versions are best after the temperatures really start to drop. Think about where you will be wearing the sweater the most: if it’s outside, then opt for a longer sleeved version but if you will be primarily using it to layer in the office, a sleeveless or short-sleeve version will be more comfortable to wear indoors. If you can, try to add a variety of sleeve-lengths to your closet so you can layer whatever the weather forecast. Knit – Be careful to not invest in a knit with a large, loose weave. Larger weaves can be easy to snag on furniture while smaller, tighter weaves can last for years without snags. Care Instructions – Sweaters come in all shapes and sizes and so do their care instructions. Be sure to read washing instructions before buying any sweater! Be ready to commit to dry-cleaning and brushing away any pills your sweater many acquire over the years. Color – Neutral sweaters, as seen above, come in a wide variety of hues. Be sure to find a flattering shade for your skintone. Don’t opt for an orange-based brown sweater if you’ve always looks garish in orange. Neutral colors often have warm or cool undertones to their hues so pay attention to which ones look best on your complexion. Always fold your sweaters when storing between uses, do not ever hang them. They will stretch out and lose their shape overtime! Clean your sweaters regularly and according to their care instructions. Many knits, even ones that say dry-cleaning only, can be washed easily with a no-rinse detergent (like this one) or a special, cashmere detergent for your cashmeres (like this one). Remember that the more you irritate and agitate the sweater you are washing, the quicker it will wear! Always baby your sweaters and they will last you twice as long. Store your sweaters with cedar blocks to keep them safe from moths (find some here). Be sure to lightly sand the cedar blocks every six months to ensure potency. Find the nail polish, Marc Jacobs ‘152 Bark’, featured above here! You can also read more about Fall Neutral Nails with Ashley here.